Happy Independence Day, America! Today’s choice for Story Games Week comes from a truly independent thinker when it comes to game design, jim pinto of post world games. 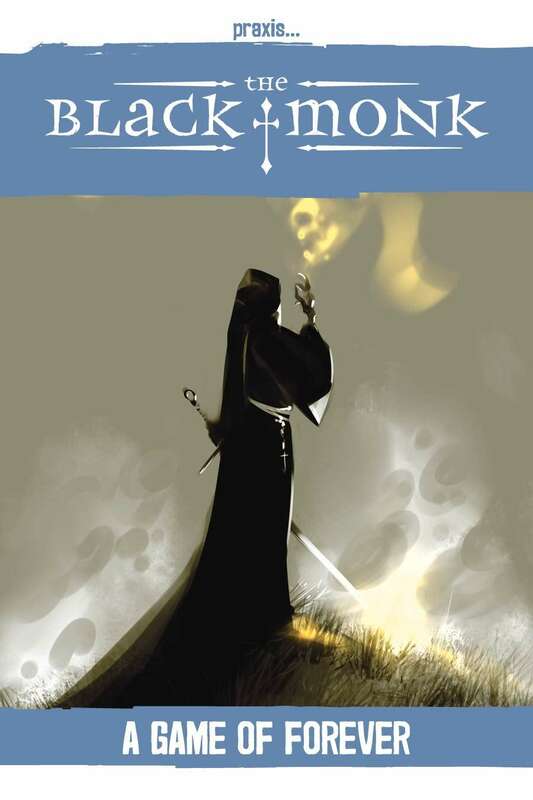 Employing his innovative Protocol system for GM-less story game play, Praxis: The Black Monk is a powerful gateway to a style of RPGs that’s gaining a lot of traction in the hobby. This is a game for those who wish to delve deep into narrative in which they not only play a role, but have a desire to express story for others to engage with. In The Black Monk, the characters are people living in a desolate, but vibrant world where time seems to have lost meaning. Living for decades, perhaps longer, in isolation from others, the people of Elysia toil in work, only to be visited once a year by the Black Monk. In between these visits, their lives are interrupted by sometimes trivial and other times confusing events. Everything seems to fit together like an elongated jigsaw puzzle, but no one can see the starter pieces stretching across the horizon.